If you like to make your own bread a stand mixer would be quite helpful to facilitate the work involved in preparing the dough. But of course, stand mixers are not used just used to make bread. They are kitchen appliances used for mixing, beating, folding, and whipping all kinds of food ingredients. They generally have a large bowl (approximately 4 to 8 quarts) that is locked in place on a stand while the mixer operates. Typical home models are equipped with a wire whip for whipping creams and egg whites, a flat paddle for mixing batters, and a hook for kneading dough. There are many companies that make stand mixers. This review will compare three very popular stand mixers: the Cuisinart SM-70BC, the KitchenAid Professional 600 Series, and the Ankarsrum Original AKM 6220 (used to be known as Electrolux/Verona). These stand mixers are among the best available and have received mostly excellent reviews from Amazon customers (at the time this article was written each had received an average rating of no less than 4 stars - the maximum being 5 stars). Please read carefully the final recommendations provided at the end of this review before you decide which stand mixer to buy. (*): Electronic speed sensor automatically adjusts motor torque to the load. 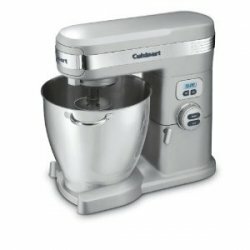 (**): With the Cuisinart and Ankarsrum stand mixers, the automatic shut-off feature works in conjunction with the Timer. With the KitchenAid stand mixer, there is no Timer, and the auto shut-off happens only when there is overload or overheating. Cuisinart: Chef's whisk, flat mixing paddle, dough hook, and splash-guard. ​Ankarsum: Cover, roller, scraper, dough hook, poly beater bowl, whips, whisks. KitchenAid: Burnished flat beater, spiral dough hook, pouring shield and stainless steel wire whip. (****): Limited 3-year product warranty and a full 5-year motor warranty. Detailed descriptions of the three stand mixers and final recommendations follow below. This stand mixer measures 15.5" by 11" by 14.5" and has a large 7-quart stainless steel bowl which can accommodate large batches of dough. Housed in durable die-cast metal, the unit features a powerful 1,000-watt motor that can handle the heaviest mixing tasks. It provides 12 mixing speeds, along with a 15-minute countdown timer and automatic shutoff, for maximum precision. You can choose the slow-start function to eliminate splatter or the ultra-gentle fold function to carefully blend in delicate ingredients. The machine performs very well, and it leaves very little batter unmixed even if you don't bother to scrape the bowl yourself. It is also pretty quiet in its operation. The tilt-back head allows for easy access to the mixing bowl and makes attaching accessories a snap. Accessories include a chef's whisk, a flat mixing paddle, and a dough hook, as well as a splash-guard. This stand mixer also contains extra power outlets for its optional dedicated attachments (meat grinder, citrus juicer, blender, or pasta maker--all sold separately, see below for attachment prices). When you compare stand mixers this one stands out as a heavy duty and well designed mixer that is a pleasure to use. Best of all, it comes with a three year product and a five year motor warranty! 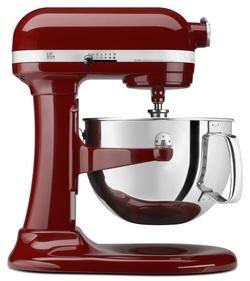 This stand mixer measures 16.5" by 14.6" by 11.3" and has a 6-quart stainless-steel mixing bowl. It features a 575-watt motor, and it can effectively mix up to 14 cups of flour. The spiral hook replicates hand kneading with a forceful rolling and punching action. The mixer's 10-speed slide control ranges from a very slow stir to a very fast whip, while its soft start mixing function minimizes ingredient splatter after start-up. The multipurpose attachment hub, equipped with a hinged cover, flips open to allow for easy installation of attachments. An electronic speed sensor helps maintain a constant mixing speed, even when adding ingredients. The mixer automatically shuts off if overload is detected. There is no timer functionality. It comes with one year warranty on parts and motor. Accessories include a professional wire whip, a spiral dough hook, a flat beater, and a pouring shield. Of the three mixers compared here, this one has the largest mixing bowl. It can hold up to 8 quarts. It measures 13.5" by 10.5" by 15.7" and weighs 19 lbs. 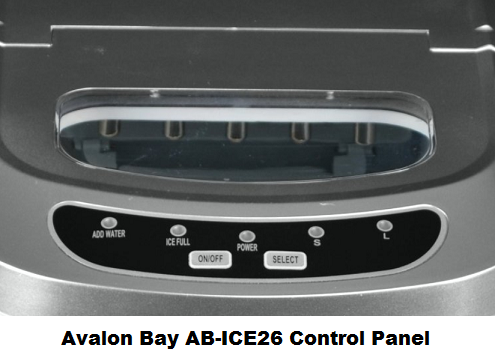 It comes with an attractive control panel that is very easy to read, and offers mixing speeds from 40 to 140 RPM. The powerful 600 watt motor runs smoothly and quietly. A timer provides the automatic shutoff functionality. Depending on the loaf size you prefer, this machine can make enough dough for anywhere between 7 to 10 loaves of bread as it can hold up to 28 cups of flour. It efficiently emulates the kneading by hands. While the scraper folds steadily the dough, the roller delivers a powerful kneading action. The resulting dough is smooth, supple and pliable. When you compare stand mixers the Ankarsrum original stands out as an exceptionally strong dough mixer with excellent reliability. The entire motor enclosure is made of metal, while the bowl is made of stainless. It is heavy duty and will not move on your kitchen's counter while it's running. Finally, it comes with a two year, parts and labor, manufacturer's warranty. The only negative is really the somewhat steep price. But as they say: you get what you pay for! So, which Stand Mixer to buy? 1At over $600, the Ankarsrum is the most expensive, and you may want to opt for the Cuisinart or the KitchenAid, if you don't want to pay as much. 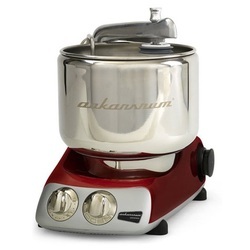 2On the other hand, if you are planning to use your mixer for making large batches of bread, you should definitely get the Ankarsrum. Not only does it have the largest bowl of all, but its motor and gears are able to handle much better large repetitive loads of dough. 3Some customers have complained that the KitchenAid unit may at times overheat and shut off due to overload even when the mixed ingredient quantities respect the unit recommendations. You will experience no such problem with the Ankarsum. 4Though the KitchenAid mixer has a more stylish and industrial look, the Cuisinart mixer seems also to perform better than the KitchenAid unit. This is because, like the Ankarsrum, it has addressed some of the problems found in KitchenAid mixers such as overheating with large repetitive loads, or the absence of timer functionality. Note that both the Cuisinart and the Ankarsrum units are equipped with a timer and they shut off when the set time has elapsed. The KitchenAid shuts off only when there is overload or overheating. 5Finally, warranty differences should also be considered when you compare stand mixers. The best warranty comes with the Cuisinart (5 years for the motor and 3 years for other parts), followed by the Ankarsrum (2 years for the motor and parts), followed by the KitchenAid (one year for everything). In conclusion, we can safely claim that the Ankarsum is the sturdiest of all stand mixers and can handle the largest repetitive batches of dough. 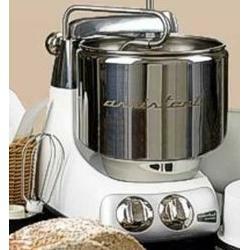 It is definitively the best bread mixer on the market! Note that Amazon often provides a good discount with respect to the List Price (both the List Price and the actual Amazon price will be shown when you click the products below). When you click the images below, you will also be offered additional colors to choose from whenever avaiable. Note: KItchenAid also makes the ARTISAN KSM150P stand mixer which is extremely popular but smaller and less powerful than the KitchenAid Professional 600 Series stand mixer described above. It has a 5-Qt. stainless steel bowl with comfortable handle that offers enough capacity to mix dough for 9 dozen cookies or 4 loaves of bread in a single batch. The 10-speed and 325 Watt unit comes with a coated flat beater, coated dough hook, 6-wire whip and 1-piece pouring shield. The flat beater and dough hook are dishwasher-safe. It has a tilt-head design which allows clear access to the bowl and attached beater, so you can easily add ingredients for your recipe. It is offered in various colors and many optional accessories/attachments are available.